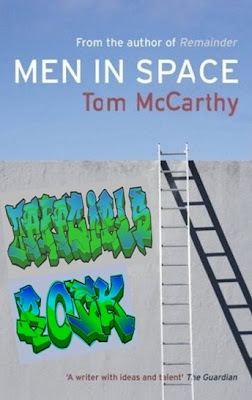 ALMA BOOKS are giving away a signed hardback copy of Men in Space by Tom McCarthy to go with his interview on The View From Here. For a chance to win, tell me what you would graffiti on the wall in the picture opposite. "In the absence of any obscene words or images, I choose JafaGirls Rock. I like it. It's enigmatic. You see it and wonder who JafaGirls are, or if it's a command (like the expression Finnegans Wake could be), and you think of Jaffa Cakes, and rocks. Yup, that one gets my rosette. Hope she/he likes the book." Thanks Tom and well done JafaBrit a signed copy of Tom's book in the post to you! I like it. It makes the ladder look even more mysterious. Mysterious, I agree. And artistic. Like your artwork too. :-) Well done. Jafabrit: O my gosh I'm sorry, I'll chase ALMA books who were going to send the book directly to you themselves.